This was done for Mandy and Jimmy when they were an item; they’re still the best of friends so I thought I’d just show what I did for their joint birthday card in 2003. 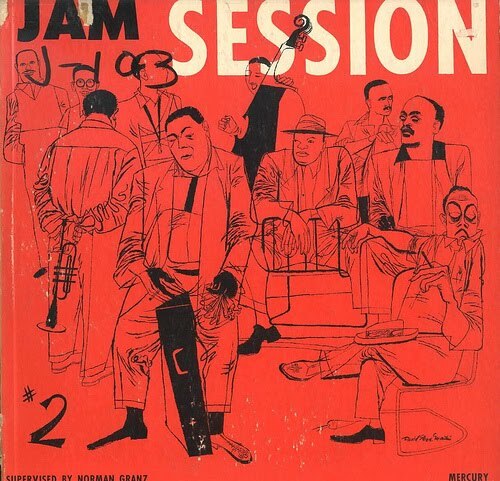 To any jazz record sleeve fan, I hope it’s a recognisable pastiche of the fifties’ illustrator David Stone Martin whose work provided awe-struck kids like me with more reasons to love America. He and jazz were inseparable; he took risks, didn’t bother to ponder the details of a piano, or a tenor sax or a drum kit because he was giving you the straight, no chaser, experience of the music. So this was made to fit a CD case and inside I made a compilation of Horace silver, Miles and Cannonball Adderley classics. In the 50s and 60s jazz sleeves were either photographs or drawings and unless the photographs were great, which they sometimes were, then DSM and his fluid calligraphy won hands down every time. See an example on the brilliant Ulcercity blog, by D B Dowd, a St Louis-based illustrator and commentator.